Dr. Medicine Crow is a Crow historian and author of Native American history and reservation life, best known for his writings and lectures on the Battle of the Little Bighorn. In particular, Dr. Medicine Crow wrote the story and script for an outdoor drama called Custer’s Last Stand at Little Bighorn, acclaimed as one of the greatest outdoor historical dramas in the country. It runs every year on June 25 and 26 near Hardin, MT and draws thousands of people from the United States and Europe. Dr. Medicine Crow has a Master’s degree in anthropology and an honorary doctorate from the University of Southern California. He also holds honorary doctorates from Rocky Mountain College and the University of Montana and has been the recipient of the Bronze Star, the Chevalier Légion d’honneur and the Congressional Gold Medal. In his interview, Dr. Medicine Crow shares the migration story of the Aapsaalooke, or Crow Indians. 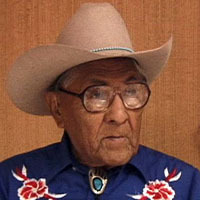 Aapsaalooke (Crow) Migration Story - Joe Medicine Crow.